Our Quality, Value and Service is second to none. Our goal is to provide your company with the finest quality tags and labels at the lowest possible prices. We also provide our customers with prompt professional customer service. We have been meeting the tag and label needs of our industrial and retail customers for over 40 years. Let us help you meet your company's tag and label needs. If there is a tag or label item you need which is not listed above, chances are we carry it in stock or can get the item for you. We carry thousands of different types of tags and labels. Please note your tag specifications on the inquiry form for a price quote. Currently, our website focuses on the stock and custom tags we sell. However, we will be expanding our website shortly to include more detailed information on the stock and custom labels and ribbons we sell. In the meantime, please note on the inquiry form with any questions you have related to stock or custom labels or ribbons. Creative Tag & Label Company routinely purchases obsolete blank tags and labels from companies. 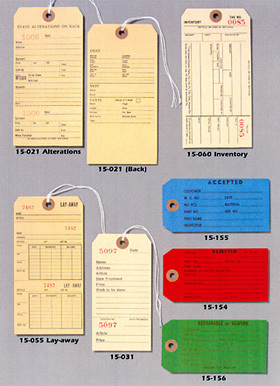 We are especially interested in tags or labels used by the meat packing industry. Just note on the inquiry form what items you would like.